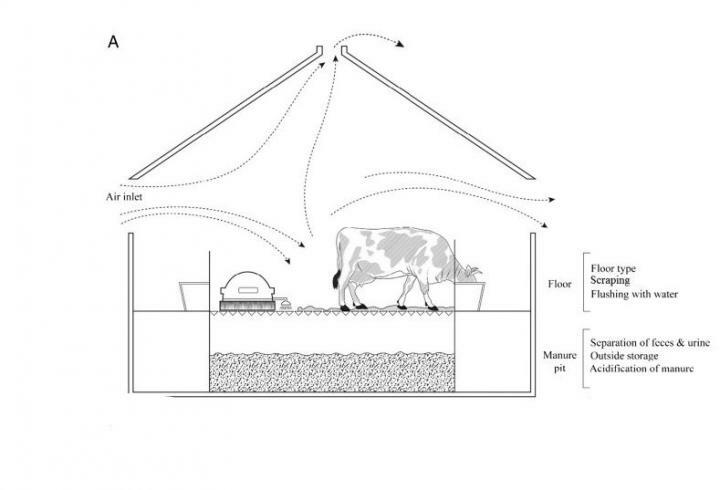 Improved barn design, cleaning processes, and manure treatment could reduce ammonia emissions from commercial dairy cattle barns by 17 to 50%, according to a new study published in the journal Science of the Total Environment. The study provides a list of techniques and technologies that could provide the greatest reductions in ammonia emissions. Reactive nitrogen pollution and, more specifically, ammonia pollution in general have impacts on both the environment and human health–it can lead to algal blooms in freshwater, threatening aquatic wildlife, and contribute to smog that damages human health. "Under the Natura 2000 framework, EU member countries were requested to regulate their discharge of reactive nitrogen into protected natural ecosystems," says study lead author Luciano Barreto Mendes, a postdoctoral fellow in the IIASA Air Quality and Greenhouse Gases and Ecosystems Services and Management programs. "But there is a lack of empirical data on how to do this. Our study aimed to assess to what extent management and design technologies could reduce emissions in full-scale commercial dairy cattle cubicle barns." Mendes and colleagues approached the problem using a model of ammonia emissions that was designed to calculate the ammonia emission reductions potential of new or adapted dairy cattle barns. It incorporates management technologies and processes designed to reduce pollution. In northwestern Europe, dairy cattle are usually housed in large barns, where they are kept loose, and manure, which is the source of ammonia emissions, is removed and stored in a pit beneath the barn. A number of factors contribute to how much ammonia escapes from the manure into air, including chemical processes, temperature, and air flow. The new study assesses the emissions reduction potential of a number of techniques, including floor scraping, flushing with water, manure acidification, and using different types of flooring. "Cow manure may not be the most glamorous subject for research, but the fact is that how we deal with waste has a major impact on the health of our environment. This study provides a useful set of interventions that farmers and agriculture policymakers can use to inform their compliance with EU regulations," says Mendes.